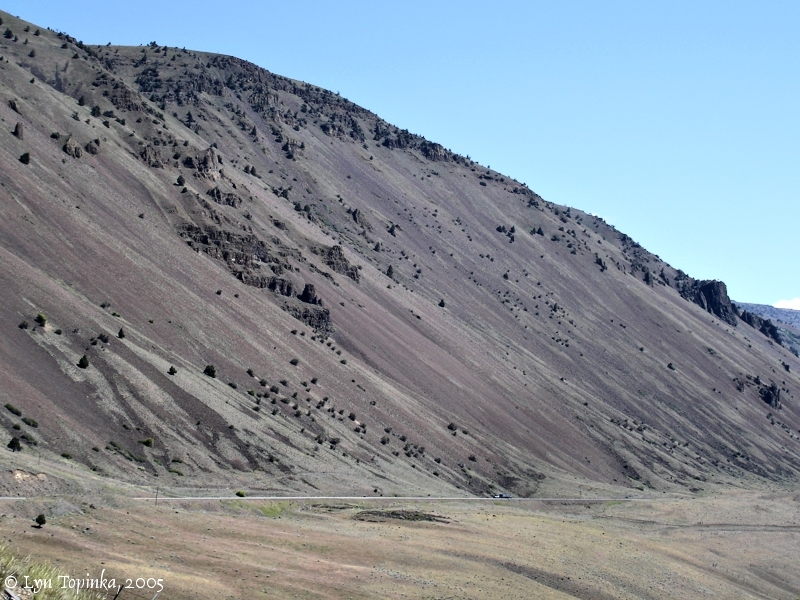 "Columbia Hills (Ortley Anticline), Washington"
Click image to enlarge Columbia Hills, Washington. View from old Oregon Highway 30, from between Celilo and the Deschutes River. Image taken September 26, 2004. The Columbia Hills, also known as the Ortley Anticline, is an expansive section of hills rising over 2,000 feet above the Columbia River, extending from the Klickitat River on the west to Rock Creek on the east, and overlooks such areas as the Maryhill Museum, Stonehenge Memorial, the John Day Dam, and the Haystack Butte area where Lewis and Clark camped in 1806. 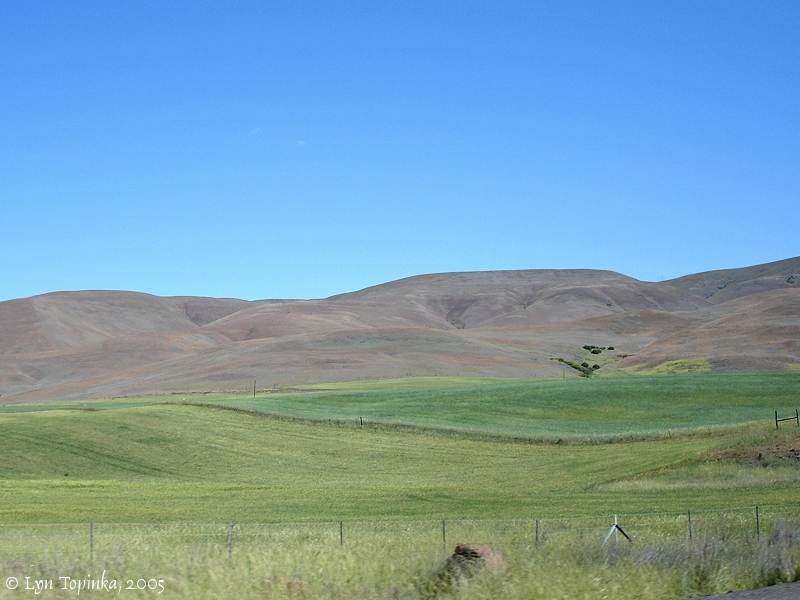 The Columbia Hills is the western edge of a much larger region called the Yakima Fold Belt. 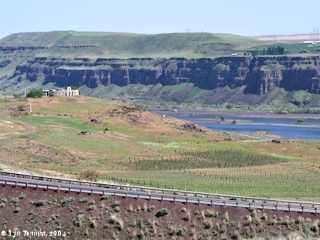 The Yakima Fold Belt is a section of lava flows of the Columbia River Basalt Group (CRBG) extending along the northern banks of the Columbia River east of the Cascade Range. The Yakima Fold Belt consists of a series of generally east-west-trending anticlinal ridges (high points) and synclinal valleys (low points) that were produced under north-south regional compression. These folds extend from the southern Columbia Plateau into and through the Cascade Range. Folding was initiated during middle to late Miocene time (17 to 5.5 million years ago) and has continued to this day. 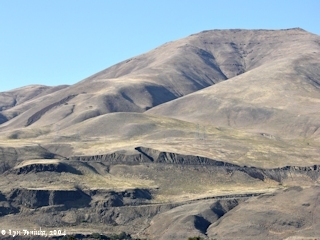 The Columbia Hills, also known as the "Ortley Anticline", are in the western part of the Yakima Fold Belt. 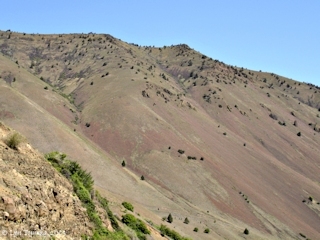 Further upstream are other named ridges such as Alder Ridge, Canoe Ridge, and Paterson Ridge, which are anticlines within the Columbia Hills Uplift. 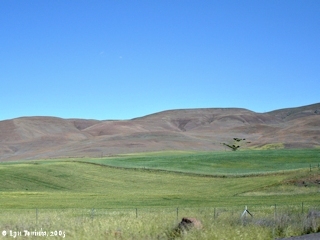 Furthest east in the Yakima Fold Belt lies another anticline, the Horse Heaven Hills. 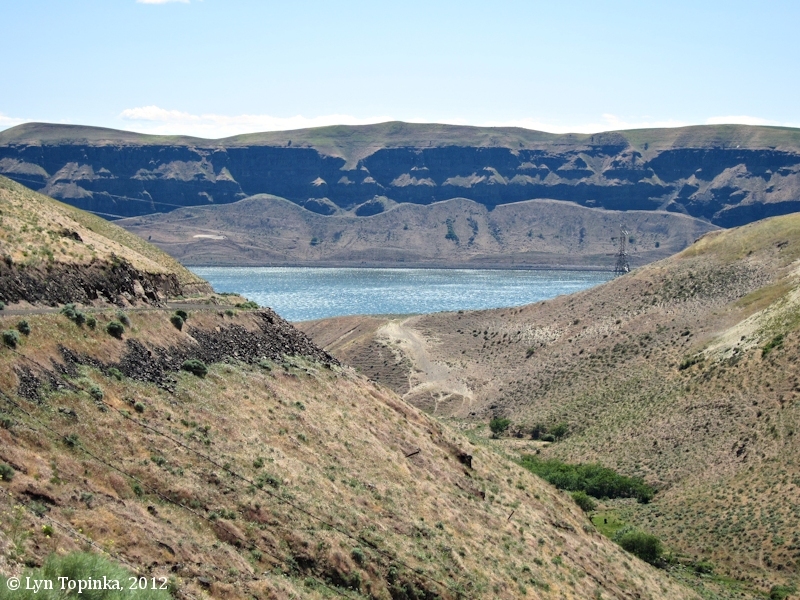 Click image to enlarge Spring, Columbia Hills near the John Day Dam. Image taken May 24, 2005. 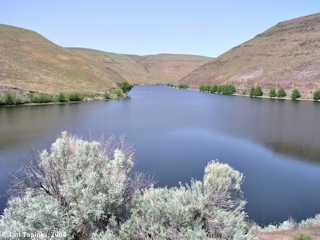 Click image to enlarge Spring, Columbia Hills near the John Day Dam. Image taken April 24, 2004. Lewis and Clark's campsite of April 21, 1806, was in the Columbia Hills near Haystack Butte, at an Indian village. The route map (Moulton, vol.1, map#77) shows the camp to be on the Washington side across from and downstream of the mouth of the Deschutes River and across from the downstream end of Miller Island. 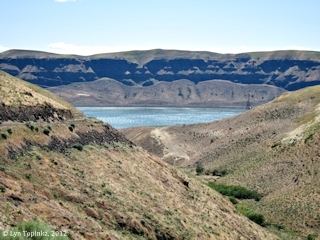 The massive Missoula Floods covered the Columbia Hills area to an elevation of 1,000 feet, with a nearly one-mile-wide bench being carved into the basalt flows at the 800 foot level. The Maryhill Museum and the Stonehenge Memorial sit on that bench. At the western end of the Columbia Hills is the Rowena Gap, also known as the "Ortley Gap", a constriction of the Columbia River which backed the waters of the Missoula Floods for miles. Click image to enlarge Stonehenge Memorial, Maryhill, Washington, perched on the banks of the Columbia River. Image taken April 24, 2004. 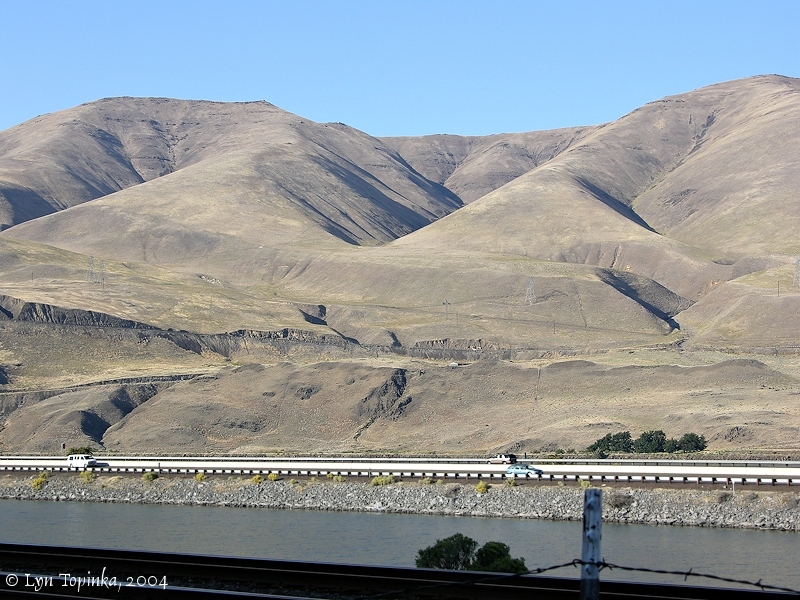 North-south running Interstate 97 leaves the Columbia River and climbs the Columbia Hills, heading to the Washington communities of Goldendale and Yakima. 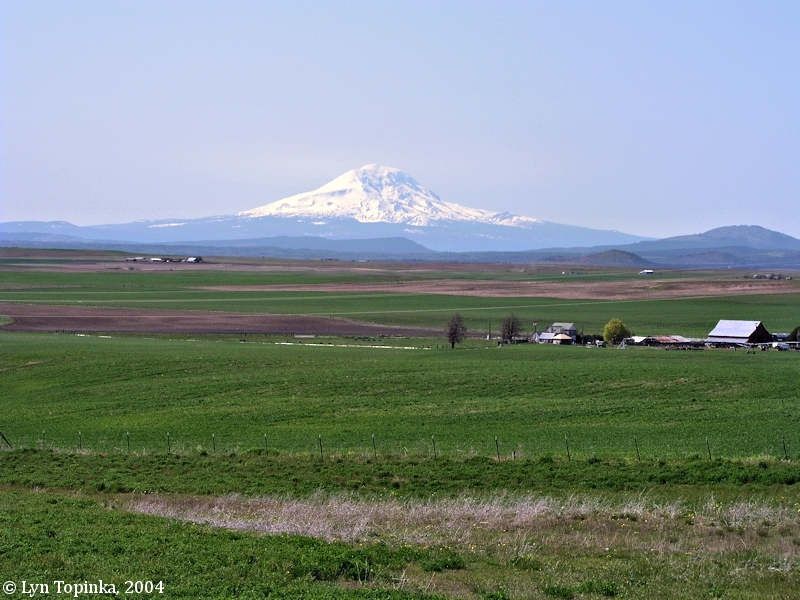 Views of Mount Adams can be had from the top of the Columbia Hills. 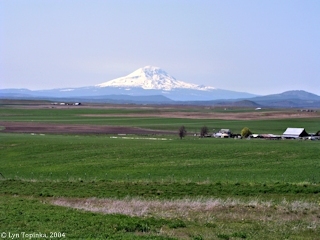 Click image to enlarge Mount Adams as seen from the top of the Columbia Hills, Klickitat County, Washington. 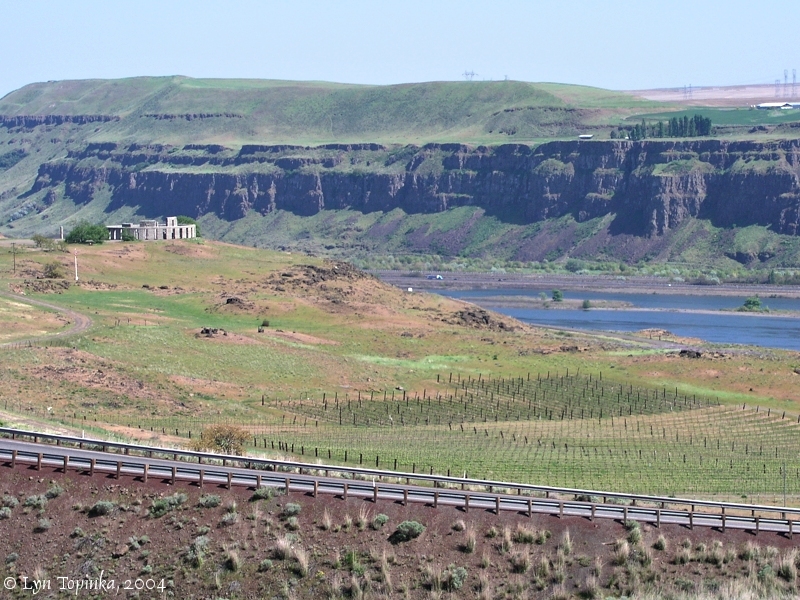 View from Interstate 97 near Goldendale, Washington. Image taken April 24, 2004. 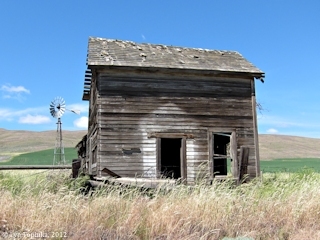 The Columbia Hills stretch across Klickitat County from the Klickitat River on the west to Rock Creek on the east. Part of the Columbia Hills is Goodnoe Hills, rising up from the west bank of Rock Creek. Click image to enlarge Goodnoe Hills homestead, Rock Creek vicinity, Columbia Hills, Klickitat County, Washington. Image taken June 6, 2012. Click image to enlarge Goodnoe Hills schoolhouse,Rock Creek vicinity, Columbia Hills, Klickitat County, Washington. Image taken June 6, 2012. 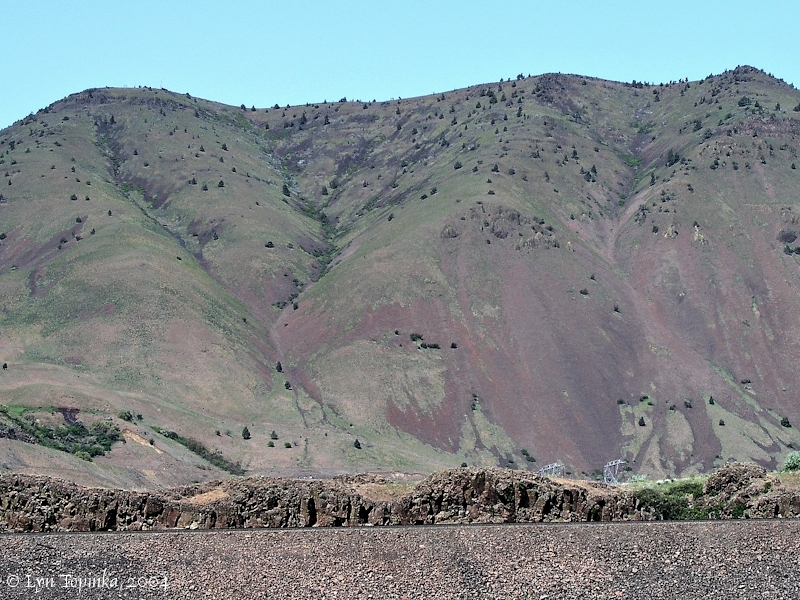 Click image to enlarge Haystack Butte, Washington, as seen from the Celilo area, Oregon. View from old Oregon 30 between Celilo and the Deschutes River. Image taken May 24, 2005. 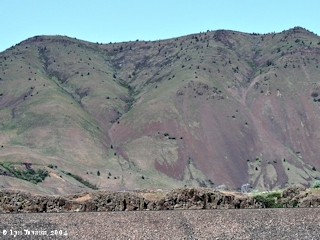 Click image to enlarge Haystack Butte (Columbia Hills) downstream of Maryhill, Washington. 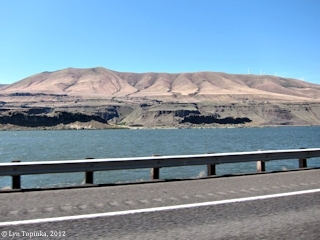 View from Oregon Interstate 84. Image taken June 6, 2012. Rock Creek forms the eastern boundary of the Columbia Hills. 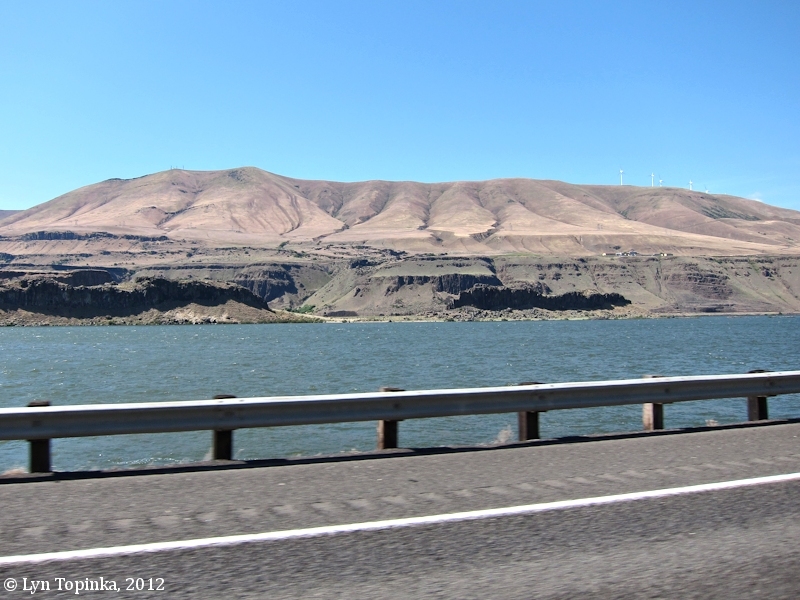 Rock Creek merges into the Columbia River at Columbia River Mile (RM) 229, in T3N R19E, Section 32. Click image to enlarge Rock Creek, Klickitat County, Washington, at mouth looking upstream. View from Washington State Highway 14 bridge crossing Rock Creek, at the backwaters of Lake Umatilla (the reservoir behind the John Day Dam) flooding the Rock Creek drainage. The eastern edge of the Columbia Hills rise on the left. Image taken April 24, 2004. 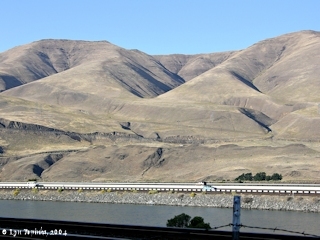 The basalts of the Rowena Gap (also known as the Ortley Gap) are the western edge of the Columbia Hills/Ortley Anticline where it is truncated by the Columbia River. 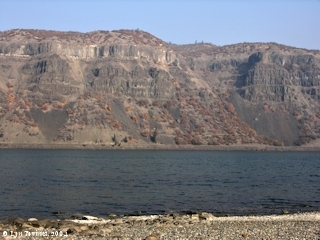 Click image to enlarge Rowena Gap basalts, Washington side, view from Mayer State Park, Oregon. The Rowena Gap is where the Columbia River carved a channel through the Ortley Anticline. Image taken November 11, 2004. Sand Spring Canyon meets the Columbia River at Columbia River Mile (RM) 225, in T3N R18E, Section 26. Sand Spring is approximately two miles up canyon. 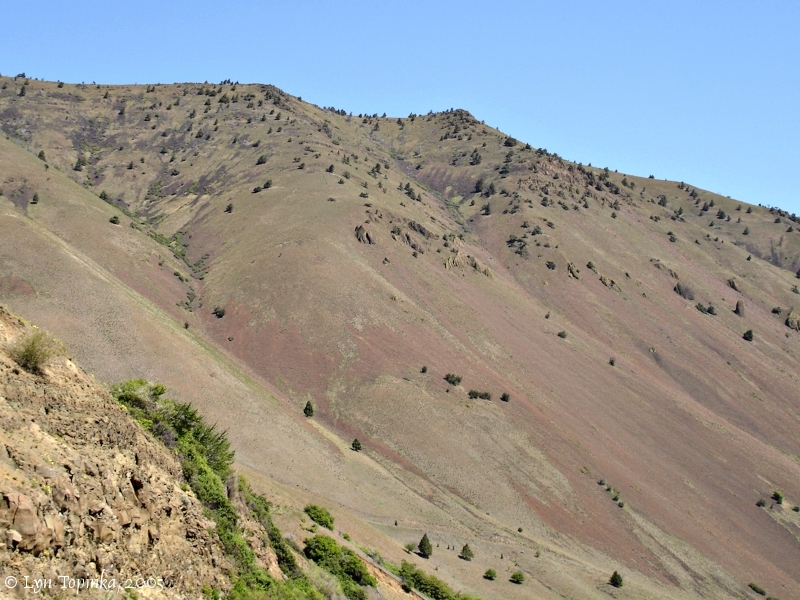 Click image to enlarge Sand Spring Canyon, looking south towards Oregon and the Columbia River, from the Columbia Hills, Klickitat County, Washington. Image taken June 6, 2012.
last night 2 of our horses broke loose and Strayed of at a Short distance. at 7 oClock we loaded up and Set out [their camp was two miles upstream of Wishram, Washington, across from the western tip of Miller Island, at the base of Haystack Butte], haveing previously Sent off the Canoe with Colter and Potts we had not arived at the top of the hill which is 200 feet [Columbia Hills] before Shabonos horse threw off his load and went with great Speed down the hill to the Village ... and delayed Capt. Lewis and the rear party ... dureing the time the front of the party was waiting for Cap Lewis, I assended a high hill from which I could plainly See the range of Mountains which runs South [Cascade Mountains] from Mt. Hood [Mount Hood, Oregon] as far as I could See. I also discovered the top of Mt. Jefferson [Mount Jefferson, Oregon] which is Covered with Snow and is S 10° W. Mt. Hood is S. 30° W. the range of mountains are Covered with timber and also Mt Hood to a sertain hite. The range of Mountains has Snow on them. I also discovered some timbered land in a S. derection from me, Short of the mountains. Clarks river which mouthes imedeately opposit to me [Deschutes River] forks at about 18 or 20 miles, the West fork runs to the Mt Hood and the main branch Runs from S. E. after Capt Lewis Came up we proceeded on through a open ruged plain about 8 miles to a Village of 6 Houses on the river. here we observed our 2 Canoes passing up on the opposit Side and the Wind too high for them to join us. I halted at the mouth of a run [Historians suggest perhaps Harley Canyon] above the village near Some good grass to let the horses graze and for the party to dine. ... after we proceeded on up the river about 4 miles to a village of 7 mat Lodges. here our Chopunnish guide informed me that the next villg. was at Some distance and that we Could not get to it to night, and that there was no wood to be precured on this Side. a man offered to Sell us a horse for a Canoe. just at the moment we discovered one of our Canoes on the opposit Side [quite possibly near the mouth of the John Day River]. 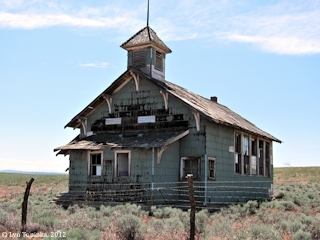 we concluded to Camp here all night with the expectation of precureing some horses [across from the John Day River]. ... the air I find extreemly Cold which blows Continularly from Mt. Hoods Snowey regions. ... we made 14 miles to day with the greatest exirtion. Serjt. Gass & R. Fields joined us with one Canoe this evening. the other Canoe with Colter & pots is a head.